This page is mostly done. Site links are orange, External links are blue. The weight needed to float the top is temperature dependent, and so alters the top's Moments of Inertia (MI). The temperature range examined was from about room temperature (70F) to lower temperatures easily obtainable outside in Colorado Springs (to 15F). For the measurements shown here, both the top and base were brought to the shown air temperature by putting the them in a room of the given temperature, balancing the base, then leaving them for several hours. The 45F was done outside about an hour after moving the Levitron from a 55F room; the 40F to 32F was done outside over night as the temperature slowly dropped. The 15F case was done outside on a very cold morning. When I had to handle the top to change weights, I waited a while before trying to float it. At the lower temperatures, it became harder to balance the base, and then to select the proper weight - at 15F only one weight combination would work (about 1 minute float) after several attempts at carefully lifting the top into position. The 2015 data points and trend are shown in green. Mass needed to float the top decreases at about -0.033g per degree-F (-0.059g per degree-C). Originally I took the 15F data point intending to extend the range of the 2014 (blue) data. But the following day I discovered, by trying to float the top at 70F for another purpose, that less mass was now needed (20.03g instead of 20.23g) than six months previous. So I have included the 15F data point with new measurements up to 70F, taken within two weeks of the 15F point, to account for the weakened magnetic field strength of the Levitron components. The purple trend line includes the 15F point with the 2014 (blue) data, while the red trend line excludes the 15F point from the 2015 (green) data, suggesting that including the 15F point with the other 2015 data is the better choice. The orange data point shows the mass of the Levitron top ( 21.35g) in the S.H.R. Paper. I'm guessing the mass of this top reflects the weighting needed to make it float under laboratory conditions, including a comfortable working environment of about 68F (20C) degrees. 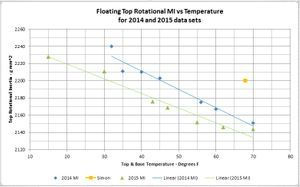 In this chart of Rotational Moment of Inertia vs Temperature for the seven 2014 data points above (blue points & trend), the top's moment of inertia decreases with rising temperature as a result of less needed mass to allow the top to float, at about -2.13 g mm^2 per degree-F over the 38F degree range (or at about -3.83 g mm^2 per degree-C over the 21.1C degree range), least squares fit. I had expected this MI vs Temperature chart to more closely mirror that of the Mass vs Temperature chart above. But the large deviations of the MI values from the trend line especially at the lower temperatures are in part due to the differing diameters of the adjustment weights. For instance, the two orange weights used in the 32F case (blue data) have a higher MI (0.073e-6 kg m^2 total ) than does the single small brass weight (0.0594e-6 kg m^2) in the 15F case, even though the brass weight has more mass (1.00g vs 0.84g total for the two orange weights). This is because the orange weights have a larger diameter than than the small brass weights. In this example, the 15F case actually has a lower total MI than the 32F case, even though its total mass is higher. The orange data point shows the measured rotational moment of inertia of the Levitron top (2200 g mm^2) in the S.H.R. Paper, assuming the weighting for room temperature of 68F (20C) degrees. WHAT ABOUT THE TOP WITHOUT WEIGHTS? So what would the approximate temperature need to be to float my top without any weights? then (x - 70)F = -3.8g / (-0.032g/F) => xF = 118.75F + 70F = 188.75F (87C) degrees (roughly!). - U is the potential energy of the top & base system. - mu is the dipole moment of the top; centered at the top's center of mass and primarily directed vertically downward when the top is in the in the stable balanced region, with value mu. - B is the magnetic field strength of the base magnet at the top's center of mass, and primarily directed vertically upward when the top is in the in the stable balanced region near the vertical axis of the the base magnet's field, with value B. - z is the height of the top's center of gravity (and near center of the top's ring magnet) vertically over a reference point, and assumed here to be along the vertically symmetric axis through the base (ring or square) magnet's field. mu*Bdz = m*g, where Bdz is the partial derivative with respect to z of the magnetic field B of the base at the top (at the balance point). The quantity "mu*Bdz" is the upward force of the interacting magnetic fields acting on the top, while the quantity "mg" is the weight of the top. (For this discussion, stabilizing forces, top rotation, etc., can be ignored.) All of this is drawing from the equations of Section "How It Works" on page 287 (But the article is only seven pages long!) of the S.H.R. Paper. The potential energy and force relations are implicitly dependent on the temperature: I want to make the force relation explicitly dependent on the system's (magnets of top and base) temperature by including multipliers of B and mu (but not dependent on them) incorporating the magnetic material property of "Temperature Coefficient of Remanent Induction." For manually starting the top at a given temperature, the balance point height above the base top can be varied over a small range by adjusting the top's weights - too light and the top immediately flies off, too heavy and the top immediately drops to the base. As the temperature drops (and the magnetic strength increases) more weight has to be added to bring the top back into the small stable range, which appears (without too close examination) to remain roughly the same height above the base. For now, I'll assume the height h above the base of the stable range and the size of the stable range are both constant. This means that any percent change in the product mu*Bdz due to temperature, will have to be reflected by the same percent adjustment in mass m to keep the top floating within the small range near constant height h.
The permanent magnets used in the Levitron are manufactured to exhibit a predictable linear and reversible change in magnetic strength over a useful range of temperatures, based on materials used. This rate of change in strength relative to temperature is described by the magnet's Temperature Coefficient of Remanent Induction. - E-Magnets UK (Temperature ratings page) provides a typical Temperature Coefficient of Remanent (Reversible) Induction of -0.12 %/degC for neodymium magnets. - Dexter Magnetic Technologies (ceramic magnet properties pdf), provides a typical Temperature Coefficient of Remanent Induction of -0.20 %/degC for ceramic (ferrite) magnets. Arnold Magnetic Technologies Technical Publications page has a good guide, "Understanding and Using Reversible Temperature Coefficients" (select and download pdf), and is the basis for my development of the "Tcorr" expression below. 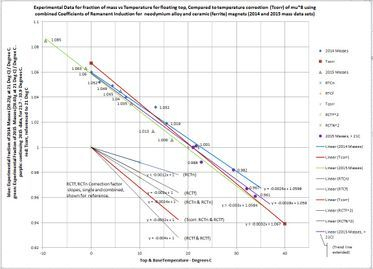 At slide 13, an example of Neodymium magnet Br [reversible induction field strength B] plotted against temperature range -50 to 150 degC is shown along with: "Note also that Br changes almost linearly up to about 150 ºC. This is true for Neo, SmCo and Ferrite." At slide 12, a formula is presented for predicting Br(T) at a new temperature T given its value Br at a specified temperature T0, assuming the linear change in strength with temperature (slightly rewritten here): Br(Tdiff) = Br * (1 + Tdiff * RTC/100), where RTC is the Reversible Temperature Coefficient, and Tdiff=T-T0 is temperature difference from that of Br (T0 = 20degC in the guide, but any reference point (temperature and associated B value) in the linear temperature range will work). where Tcorr = (1 - Tdiff * 0.0032 + (Tdiff)^2 * .0000024) will scale mass m for a temperature difference from a reference temperature (Celsius) for the Leviton with ferrite base magnet and neodymium top magnet. Late in this project, there was some 90F range weather in Colorado Springs - here is data taken in the range 71F (21.7C) - 93F (33.9C) on June 30, 2015. (The mass at 70F was measured separately on July 3, 2015.) The data points were added to the summary chart appearing below as purple dots with separate least squares fit line. Shown in RED is my hypothetical* rate of fraction of total mass decrease with rising temperature (Tcorr) needed to keep the Levitron top afloat, based on the combined typical (published) values of Coefficients of Remanent Induction for neodymium (RCTn = -0.12 %/degC) and ceramic (RCTf = -0.20 %/degC) magnets. The actual experimental fraction of total mass decrease with rising temperature needed is shown in BLUE for 2014 data, in GREEN for 2015 data (at reduced Levitron magnetic strength), and in PURPLE for data above 70F in summer 2015 (at even more reduced Levitron magnetic strength). The "y=mx+b" form of each line is shown, allowing further comparison of slopes. The Tcorr computed data points (red squares) are linear to 3 significant digits over this range, so only the endpoints are shown. 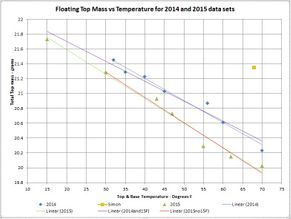 So what to do with the mass vs temperature data and the fitted lines? 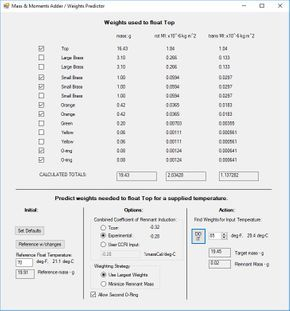 A program to predict the weights needed to float the top at a given temperature would be nice. Here is a screenshot of a Visual Basic 2010 program written to do just that. 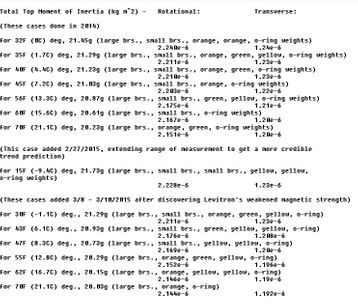 I modified an earlier program (upper portion) which totaled the masses (and moments of inertia) of the manually checked weights - a simple calculator using hardcoded values presented earlier in this article. The program assumes the Top and one o-ring are always present, removing these masses from the target mass to give a "Remnant Mass" value. It then selects available weights, largest first, decreasing the remaining Remnant Mass as long as it is non-negative.